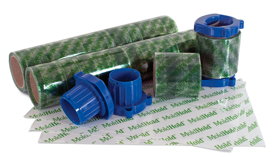 MoldHold® is the only product specifically designed to do source containment. Patented with an adhesive that sticks to wet surfaces such as mold, MoldHold® is easy to use and very effective at keeping toxins from becoming airborne. This first response product seals the entire surface instantly preventing mold spores, asbestos particles, dusty friable lead and other contaminants from toxifying your air and damaging your property. Used as part of a complete restoration, MoldHold® makes the site safer for workers and occupants; reduces the need for evacuation/displacement; allows for faster drying times; improves effectiveness of air scrubbing; and increases likelihood of better test results after remediation. 2. Does MoldHold™ replace traditional remediation or cleanup? No. It is a temporary first response for containing mold and other toxins. It should be considered part of a larger process of containment, remediation and restoration. 3. Does MoldHold™ kill mold? No. It prevents mold spores from becoming airborne. It contains mold at the source with minimal disturbance. 4. Will MoldHold™ prevent mold from recurring? No. It may slow down the spread of mold by limiting moisture but professional remediation is best to prevent recurrence. In some instances, it may be used as an abatement tool to prevent mold spores from gaining access to moisture and a food source. For example, when hydrostatic pressure introduces moisture into concrete blocks, MoldHold® has been applied to the cleaned concrete surface effectively preventing spores for reaching the moisture laden blocks. 5. Will MoldHold™ clean the air? No. It will prevent more mold spores from becoming airborne. MoldHold™ is not a cleaner. To remove mold toxins already present in the air, you may need to use professional air scrubbers. 6. Can MoldHold™ reduce my risk of getting sick from mold exposure? Maybe. MoldHold™ simply reduces the amounts of new mold toxins getting airborne but does not change the amount already present or your specific sensitivity to the presence of mold. NOTE: It is HIGHLY RECOMMENDED that you consult with your doctor before continued exposure. 7. Does MoldHold™ emit vocs (volatile organic compounds)? 8. If I use MoldHold™, will it be necessary to move out of my home or office during restoration? The likelihood of having to vacate the premises is lessened greatly. This is a decision that should be made in consultation with your restoration professional and your primary healthcare professionals. 9. Can I just use MoldHold™ and forget about cleaning up the mold? No. Mold will continue to grow without appropriate cleanup or removal. Consult with a mold remediation and restoration professional about developing an effective plan for cleaning. 10. Will using MoldHold™ lower the cost of cleanup? Yes. To get the maximum benefit from MoldHold™, it should be applied as soon as mold is discovered. The less time mold has to propagate, lower concentrations of mold will become airborne. Hence, it will cost less for air scrubbers, furniture cleaning, clothes laundering or dry-cleaning, and discarded contaminated food. Also, your heating & air conditioning equipment may be spared cleaning or replacement. 11. Can MoldHold™ be applied to a wet surface? Yes is the short answer. MoldHold™ is designed to adhere extremely well to most surfaces including wet surfaces. Use MoldHold™ on surfaces likely to be removed then disposed of, such as sheetrock. Once MoldHold™ is carefully applied to the contaminated surface, the toxic, moldy materials should be cutout and disposed of properly. Use MoldHold™ on surfaces likely to be restored, such as expensive cabinets. Once MoldHold™ is properly applied to the items, they can be safely moved for restoration without worrying about spilling spores along the way. MoldHold™ may not be the best way to go on all surfaces. Under your house on floor joists, MoldHold™ may work but since it is designed as a rapid response, temporary tool… probably the better choice is getting full remediation services. MoldHold™ is a short-term solution for encapsulating prior to remediation or restoration. It is not recommended for outdoor use. 12. Do I need a professional to apply MoldHold™? No. MoldHold™ is simple and easy to apply so just about anyone can use it: homeowners, maintenance personnel, plumbers, HVAC workers, and realtors – to name a few. Anyone can apply a bandage – that’s what MoldHold™ is … a bandage that stops the bleeding of toxins into your air. Please use personal protection clothing and equipment! RESTORATION PROFESSIONALS do get “To-The-Trade” discounts. SIGN UP on the “To-The-Trade” tab. 13. What kind of personal safety equipment should I use? For applying MoldHold™, it is recommended that you use a filtration mask that restricts 3 mil. particles and larger. Use full coverage protective clothing (preferably, disposable). Do not expose open cuts, sores or wounds to mold. For more comprehensive recommendations on safety equipment check on sites like www.epa.gov. 14. Why MoldHold™ versus other products? MoldHold™ should be your first response, rapid response to mold is because it is uniquely designed to stick to wet surfaces and to keep mold from becoming airborne. Since only airborne mold can get in your lungs, in your furniture, on your clothes, and in your HVAC systems, using MoldHold™ means you control the mold, it doesn’t control you. Some products have been rigged to work – tape and plastic; tape and shrink wrap; and even poly carpet protectors – yet none of them will stick to a wet surface and will trap mold. They only create a pocket of spores that are much more likely to be breached while remediating. Too, they require at least two people to apply them. MoldHold’s™ glues and heavy barriers make it impossible for mold to breakout and can be applied with just one person. MoldHold™ is often compared to other products that clean, kill and are used to remove mold. We don’t do that. MoldHold™ is not designed to clean, kill or remove. That is a later part of the process and can be done with many other really good products. Think of MoldHold™ as the first step in a process that is highly effective. Control the mold – at the source, minimal disturbance. This step reduces the scope and the cost of the loss. Contain the area – if you’ve found mold, it is in the air. This step keeps it from spreading elsewhere. Remediate the problem – dry, clean, kill, and remove. This step is a must to get rid of mold. Restore the area – making the area like new. This finishing step gets your property and life back to normal. Because rapid response with MoldHold™ captures the culprits where they grow without giving them a chance to blast a whopping 10,000 spores into your air supply, the scope of your restoration and the cost of your loss will be less! MoldHold™ focuses on keeping mold from taking over your health, your property and your finances. Other products focus on steps 2-4. 15. Has MoldHold™ been tested? Yes. We used an independent company called Pro-Spect to test effectiveness of MoldHold™. Working with JC Restorations, CDC recommended industrial hygienist Dennis Stage of Pro-Spect, designed and performed the testing which resulted in an affirmation of MoldHold’s™ effectiveness. Mold levels were essentially the same as if mold was not present – even during air scrubbing. A statistical analysis has not been performed to date. 16. Does using MoldHold™ require any permits? No. MoldHold™ is not part of a special process defined by government agencies. Recent discussions with the EPA confirmed that early encapsulation for mold, lead, and asbestos toxins are not currently part of their remediation protocols but stated this method of preventing toxins from becoming airborne could be very beneficial. There may be other state or local ordinances that are relevant. It is recommended that those be respected when applicable. MoldHold™ is safe. It has no dangerous compounds or other chemicals that even require a Manufacturers Safety Data Sheet (MSDS) however we do provide one as a courtesy. 17. Can MoldHold™ be used for other toxic substances like lead or asbestos? 18. What kind of shelf life does MoldHold™ have? MoldHold™ is extremely stable. It was designed to have an extended shelf life when kept at room temperatures between 55 to 75 degrees Fahrenheit. Our patent pending adhesive can withstand significantly higher temperatures as might be experienced in a vehicle in warmer climates. 19. What can I use to release MoldHold's™ adhesive? MH Restore by MoldHold™ is an outstanding adhesive remover that contains bio solvent additives. Safe for all surfaces, safe for the user and safe for the environment, it has no ozone-depleting chemicals (ODCs), no hazardous air pollutants (HAPs), and is readily biodegradable. 20. Is MoldHold™ part of any industry organizations? Yes. We currently are members of RIA (Restoration Industry Association). 21. Can I buy MoldHold™ directly? Yes. While it is primarily distributed through professional remediation companies, you may buy MoldHold™ directly through any of our expanding network of distributors. It may also be purchased through our website. It is strongly encouraged that you consult with a professional remediation company prior to attempting cleanup. 22. Can I charge the cost of MoldHold™ to my insurance company? Possibly. Check with your agent for specific policy coverage. Please note, many insurance companies limit coverage for mold cleanup and remediation. Using MoldHold™ may lessen your out-of-pocket costs. 23. Is there a MoldHold™ kit with instructions? Not at present, however, we are currently working on creating a “Mold: First Response Kit.” This kit will likely include a reasonable supply of MoldHold™ with directions for applying. 24. Does MoldHold™ have a blog? 25. What are others saying about MoldHold™? Others have been very encouraging of the whole concept of MoldHold™. My favorite comment was from the head of a fairly noteworthy government agency who got really excited about it MoldHold™ and began telling us how it could be used in many ways. He concluded by saying “every first responder should have this in their van and toolbox.” Yes! He’s right!